2008 CHEVROLET HHR LT Panel. 2008-2011 CHEVROLET HHR LS Panel. 2006 CHEVROLET HHR. 2008-2011 CHEVROLET HHR LS. 2008-2011 CHEVROLET HHR LT. Monroe uses advanced engineering and test capabilities to provide product reliability, endurance and performance. Moog St8597l Complete Strut AssemblyMoog Chassis Parts ST8597L. Suspension Strut. Public Forums. Need to make a change?. Disclosure of Information Policy. Your credit card information is encrypted while traveling the Internet. Not Compatible on SS HHR Models. Chevy Cobalt. Strut, Coil Spring and Upper Mount. Premium Strut Technology Based on Application. Suspension Strut Assembly. Each Spring is Painted or Powder-Coated for Excellent Rust Resistance. "AC Delco Shock Absorber and Strut Assembly --. Type : Strut Assembly. Notes FWD, Location : Front Passenger Side. Location : Right, Front. Therefore all implied warranties that may apply to your part are limited to the duration of this written warranty. "AC Delco Shock Absorber and Strut Assembly --. Type : Strut Assembly. Notes Perf & Handling Susp(Fe5), Location : Front, Passenger Side. Location : Right, Front. Manufactured to the highest OE standards, ensuring perfect fit and consistent performance. 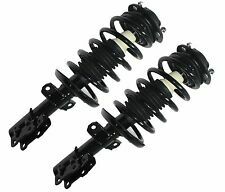 "AC Delco Shock Absorber and Strut Assembly --. Type : Strut Assembly. Notes With Sport Suspension(FE3), Location : Front, Driver Side. Location : Left, Front. Condition : New. Therefore all implied warranties that may apply to your part are limited to the duration of this written warranty. "Monroe Shock Absorber and Strut Assembly --. Stay steady as you go with the super-sturdy, technologically advanced design of Monroe’s Monro-Matic Plus shock absorbers and strut assemblies. MONROE – MONRO-MATIC PLUS SHOCK ABSORBERS AND STRUT ASSEMBLIES. "AC Delco Shock Absorber and Strut Assembly --. Type : Strut Assembly. Therefore all implied warranties that may apply to your part are limited to the duration of this written warranty. Each warranty gives you specific rights, and you may have other rights which vary from state to state.